The Hellenic Motor museum offers a different kind of tourist experience in Athens other than an indulgence into antiquity. As expected from its name, this museum is devoted to motor cars and their history. 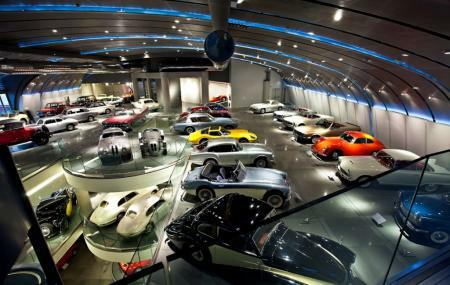 Designed by Theodoros N. Charagionis, Executive Chairman of Charagionis Group, this museum documents the history of automobiles with special focus on road safety via educational screenings and lectures. 1979 Cadillac Seville Gucci with its Gucci-designed interior and exterior fitments. Apart from these highlights this museum also houses a 3D cinema, the Museum Store, an eight-storey underground garage with 800 car park seats and a luxury resort style central square, with restaurants and coffee shops. A visit over here will introduce you to the contemporary Greece, a feature that is quite different from your general visits to ancient archaeological sites here. Closed on Easter Sunday and Easter Monday. Every Sunday, the museum visitors can watch movie show for free. How popular is Hellenic Motor Museum? People normally club together Agios Eleftherios Church and Epigraphical Museum while planning their visit to Hellenic Motor Museum. A great selection of cars, well displayed. Good information on each vehicle, makes for an interesting and informative experience. Very complete and full of history. Lots of beautiful cars.